Any item in Boulevard can be marked as non-taxable to account for states where tax is not charged on certain items such as items containing SPF, as well as whether the item is considered an over-the-counter drug product. 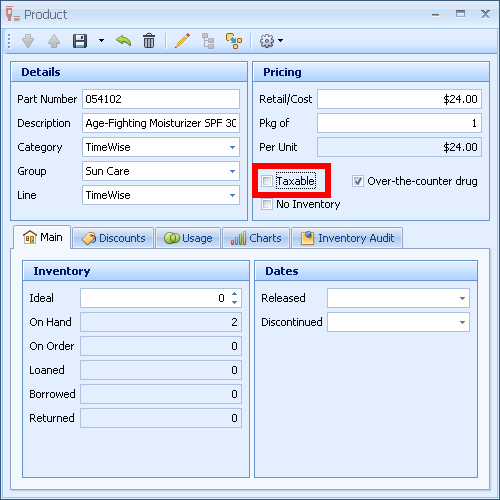 From the Shortcuts form, click Find Product, (or from the main tool bar, click , then select Find Product from the drop-down options). Enter a partial description, then double-click on the item to open the product profile. Under the Pricing section, choose whether the items is Taxable. Click the button to accept the changes made and close the form.